Fall has finally arrived, which means a few things. First of all, it’s now completely acceptable to stay on the couch all day on Sundays now that football is back. Second of all, it’s officially time to bring back out the cozy sweaters, boots and scarves that have been hiding in the back of your closet all summer. And last, but certainly not least, it’s the season for slow cooker recipes! 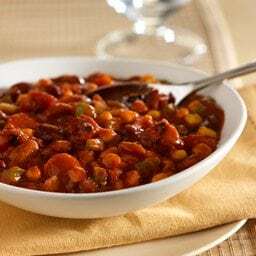 Slow cookers go hand-in-hand with cooler weather because they are perfect for thick and hearty soups, stews and chilies that warm you up instantly, just like this Slow Cooker Veggie Chili is guaranteed to do. If you’re a meat-and-potatoes kind of guy or girl, I can assure you that there’s no need to be hesitant about a meat-free recipe. This Slow Cooker Veggie Chili is so hearty and flavorful that you won’t even miss the meat. It uses two different types of beans for a little variety in taste and texture, along with a whole host of different vegetables. Don’t like one (or more) of the vegetables? No problem! You can either choose to omit what you don’t care for or you can easily substitute a different veggie that’s more to your liking. That’s the great thing about chili; it’s a dish that’s virtually impossible to mess up, so feel free to experiment with different flavors and ingredients until you find your favorite combination. This recipe is scrumptious on its own, but it’s also excellent served over corn bread, rice or a baked potato. You can even pour it over tortilla chips sprinkled with cheese for an easy nacho dinner; with this chili, the possibilities are endless. So, throw it into your slow cooker on the next chilly morning for a delicious meal that is sure to warm you up and fill you up fast. Meredith writes on behalf of Hunt’s®. For more easy slow cooker recipes and chili recipes that are perfect for fall, visit www.Hunts.com. Spray the inside of a 4-quart slow cooker with cooking spray. Place remaining ingredients in the slow cooker; stir to combine. Cover and cook on HIGH for 1-1/2 to 2 hours or on LOW for 3 to 4 hours. Made this morning and it was delicious. I left in crock pot for five hours so that carrots and onions were very tender. Super easy and will make again.